This hardware keylogger module is a special version of the KeyGrabber USB and the KeyGrabber PS/2, embeddable inside a keyboard. 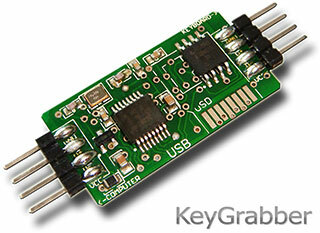 Low profile board and universal 0.1" connectors guarantee compatibility with every PS/2 and USB keyboard available. Once mounted inside the keyboard, this keystroke recorder is completely invisible for the eye and for software. Short installation guide. Please read before purchasing. Retrieving recorded data works just as in the standard (non-modular) versions. Detailed product information and specifications.